Findings from one of the first comprehensive field studies by a collaborative team of researchers demonstrate the active layer microbiome of tundra soil was significantly altered after only 1.5 years of experimental warming—a rapid response demonstrating high sensitivity of this ecosystem to warming. Collectively, the results of this study suggest the vulnerability of permafrost ecosystem carbon to climate warming and the significance of microbial feedbacks in mediating this vulnerability. University of Oklahoma team members include Jizhong Zhou, Kai Xue, Mengting M. Yuan, Zhou J. Shi, Yujia Qin, Ye Deng Lei Cheng, Liyou Wu, Zhili He and Joy D. Van Nostrand from the Institute for Environmental Genomics, plus Yiqi Luo from the Department of Microbiology and Plant Biology in the OU College of Arts and Sciences. Zhou is also affiliated with Tsinghua University and Lawrence Berkeley National Laboratory. The study provides an understanding of microbial responses to climate warming and demonstrates that warming stimulates aerobic respiration and anaerobic decomposition; nitrous oxide and methane emissions from anaerobic processes that likely amplify positive carbon feedback to warming; and warming greatly enhances nutrient cycling processes, such as nitrogen mineralization, nitrogen fixation and phosphorus utilization, which promote increases in plant growth and potentially dampens positive feedback. The northern permafrost stores nearly 50 percent of the global soil organic carbon. The permafrost has been recognized as highly responsive to climate change, yet very few studies have examined microbial responses to climate warming in tundra ecosystems in the field. 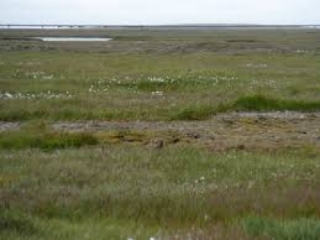 Microbial decomposition of soil carbon in high-latitude tundra underlain with permafrost is one of the most important, but poorly understood indicators of greenhouse gas emissions in a warmer world. Experimental results reported in this study were derived from the active layer of the Alaskan tundra soil. This research indicates that the soil carbon is highly vulnerable to climate warming and the vulnerability is determined by a set of complex microbial feedbacks to the temperature increase. Funding for this work was supported by the U.S. Department of Energy’s Office of Science; the National Science Foundation; the University of Oklahoma Vice President for Research; and the Collaborative Innovation Center for Regional Environmental Quality. A paper on this study has been published on the Nature Climate Change website at http://dx.doi.org/10.1038/nclimate2940. For more information about this study, please contact Jizhong Zhou at [email protected].